It’s been 25 years since Pope John Paul II visited Hamtramck, but for many it seems like it was just last week. 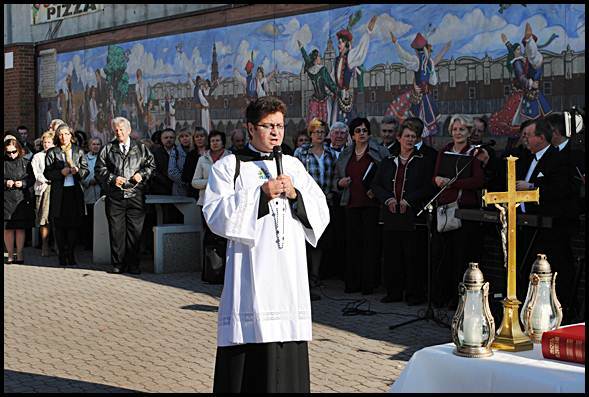 And, actually, it was just last weekend when parishioners from St. Florian Church commemorated the event. On Sunday (Oct. 21) afternoon, about four dozen members of the church gathered at the cathedral’s steps to meet for a Rosary procession down Jos. Campau to Pope Park. Carrying crosses, flags and banners while singing Catholic hymns, the group recreated a portion of the Pope’s route when he came to town on Sept. 18, 1987. Once at Pope Park, Reverend Miroslaw Frankowski performed an evening Mass to the crowd, which by that time had grown considerably larger. The event was just one of many that St. Florian Church had planned for the month of October, which is Polish Heritage Month. This Sunday (Oct. 28) St. Florian hosts its first “Polish Soup Festival” in the church hall. Stop by for food, drinks, fun and game – and lots and lots of soup. Admission is free and the event runs from 11 a.m. to 8 p.m.